The construction of the Shelter at 20 Williams Drive was originally financed by Mu Chapter Alumni and Delta Tau Delta National Fraternity. The Shelter was dedicated on October 20, 1962. Prior to this date, Mu Chapter had occupied various residences, including 57 1/2 North Sandusky Street and 163 North Franklin Street, both of which are still standing. From 1962-2010, the Shelter was managed by the local Housing Corporation. During this time, a Real Estate Management Agreement with OWU allocated the room and board fees of all live-in brothers to the House Corp. These funds served to finance an in-house cook and all internal maintenance of the Shelter. In 2010, a new Memo of Understanding (MOU) initiated by Ohio Wesleyan shifted total management of the Shelter to the University. The local House Corp is able to maintain food service through an internal cook, while many of the other fraternities on The Hill have opted to sign on with University Dining Services. Take a tour of the Shelter. Since 1962, over 700 Mu Chapter brothers have called the Shelter home. The Shelter features two floors of living space with two community bathrooms on each floor. Each Brother has his own single room, and the Shelter houses up to 30 men. Two of the benefits of living in the Shelter are free laundry facilities and premium meal service prepared by our on-site cook. The TV room features a flat panel TV, foosball table, and pool table. The basement of the Shelter features a large dining area that is also used for social events such as dance parties. The TV and dining rooms feature a large collection of past Mu Chapter composites. The front of the Shelter faces Park Avenue and the OWU Roy Rike Soccer Stadium. The front porch is a popular gathering place for cookouts, parties, and alumni gatherings. The back of the Shelter faces Williams Drive and the inside of "The Hill" that OWU's other fraternities call home. The hooplah is a popular gathering place for Brothers, friends, and alumni. The inscription in the center of the hooplah features the Delta Tau Delta letters. The walkway leading to the hooplah features bricks placed in memory of many Mu Chapter Alumni members. The Delta Tau Delta Coat of Arms is inscribed above the fireplace and in the dining room, renovated in 2012. 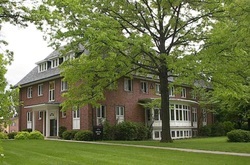 The library features a collection of past and present Ohio Wesleyan and Delta Tau Delta references, as well as a study area for Brothers and lounging area for visitors. Also inside the library are two trophy cases, full of awards and trophies that Mu Chapter has accumulated over its nearly 150 year existence on the Ohio Wesleyan campus.